DIRECTIONS: Clean your rotary tool bits with alcohol and dry off. Drill 2 small holes in your coconut at the starting points of where you want your opening to be. Drain the coconut juice out of the coconut. Cut out your coconut opening. Strain the coconut water through cheesecloth to remove any bits from the drilling, then chill the coconut water. Rinse the coconut out with clean water and set aside to dry. Add all the ingredients to your blender and blend until smooth. 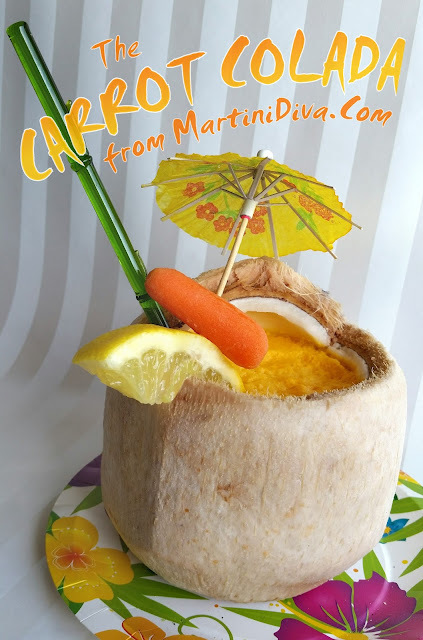 Pour into your coconut shell, garnish and serve. Yes, you can go out and buy a cute coconut looking tiki glass and buy coconut water. However canned coconut water does not have the great nutty, fresh flavor that you get out of a true, young coconut. Just truth man, Mahalo and Happy Easter! 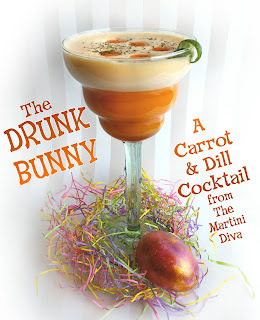 Yes, another carrot cocktail. But it's Easter, carrots are good for you, the Easter Bunny likes carrots, and they're pretty! And, yes, more egg whites because egg whites make a silky cocktail, create a beautiful foam and, come on, Easter eggs. Infuse the dill into your vodka (vodka infusing instructions here) at lest 8 hours ahead of time. If possible, give your dill vodka a few days to get happy. Add the water to the honey cream blood orange then nuke for 15 seconds to make a simple syrup. Let this cool. 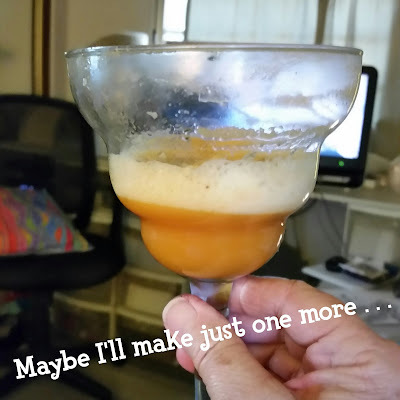 Combine the dill vodka, egg white, lime juice, salt, pepper, honey syrup and carrot juice in a blender and whip for 30 seconds to emulsify and and build foam. Transfer to a cocktail shaker, add ice and shake until chilled. 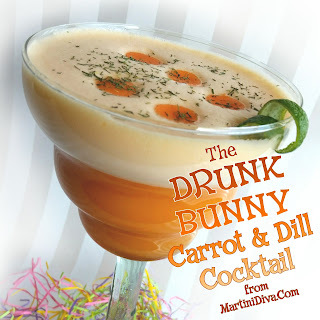 Pour into the chilled glass, arrange the carrot discs on the top of the foam, sprinkle some dill weed on top, express the oils from the lime twist over the top, drop in the twist and serve. * Yes, you've seen me using a lot of Honey Ridge Farm's honey cremes lately! They sent me some samples and I fell in love! For natural, healthy sweeteners in cocktails these are - pardon the pun - the Bees Knees! And the blood orange I used here almost never made it into any cocktail, I couldn't keep my fingers out of the honey jar and had slurped half the container away in less than two days.